Time-worn or not, it's an intriguing idea. Tim (Domhnall Gleeson), a clever 21-year-old from a prosperous family in Cornwall, learns from his Dad (Bill Nighy) that the men in their family are blessed with an unusual gift: they can travel back in time. All a fellow has to do is stand in a cupboard (closet to you Yanks), ball his fists and visualize the time he wants to revisit. And whoosh! As he further experiments with time-travel, Tim learns about its limits. As Dad warned, not everything can be changed; so Charlotte, his sister's beautiful friend, Charlotte (Margot Robbie) will still reject him, even if he travels back in time to impress her all the earlier. Tim's lesson: “All the time travel in the world can't make someone love you.” As Tim uses his talents in the romantic realm, the shallowness of Curtis' conceit becomes apparent. Aren't there better uses for time travel than getting a girl's phone number? Time travel does help Tim's courtship of Mary (McAdams), a cute American girl he meets after moving to London to work as a barrister. Tim and Mary fall in love and, in rapid order, live together, marry and have babies. The elapsed time of their courtship is signified by a montage of the couple at various times in the tube station (Yanks: subway), set to a pop song performed by a trio of buskers. 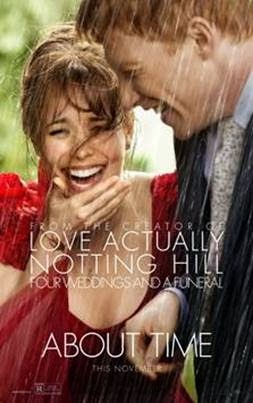 The sequence heralds the movie's disappointing march from dry British humor into soppy sentimentalism. There aren't four weddings and a funeral this time, but one wedding, one funeral, and a series of bouncing babies. There are also two special gatherings despoiled by drenching rainstorms, a device best used sparingly, if at all. Curtis favors big casts — his model for LOVE, ACTUALLY was, believe it or not, Robert Altman's NASHVILLE. He festoons this film with ancillary characters, so many it's hard to keep track. There is Tom's London flatmate, the sarcastic playwright Harry (Tom Hollander); Tim's kooky sister Kit Kat (Lydia Wilson); his workmate, Rory (Joshua McGuire); his friend Jay (Will Merrick), whose redheaded awkwardness surpasses his own; his eccentric and confused uncle Desmond (Richard Cordery); and his proper, white-haired mum (Lindsay Duncan), whose looks Harry compares, uncharitably to Andy Warhol's. None of these characters gets enough screen time to make much impression. There's an amusing digression into the premiere of Harry's new play, which flops stupendously — a lead actor completely forgets his lines — until Tim goes back in time to intercede. The theatrical anecdote suggests the zesty movie this could have been if Curtis weren't so damned devoted to sticky sentiment. As it is, Curtis insists we focus on Tim and Mary, whose romance is so good-natured and bland as to be beside the point. It becomes evident, late in the film, that the real romance is between Tim and his dad, a contemplative bloke who has used his remarkable time-travel capabilities not to gain wealth — he must have inherited the seaside mansion where they live — but to read more Dickens novels. Father and son engage in competitive repartee (French for trash talk), while playing table tennis (ping-pong to y'all). The film's last act tries to wring poignancy from the dad-and-lad bond. With their supernatural powers, father and son revisit an idyllic long-ago moment frolicking on the beach, with boyhood Tim looking for all the world like Andy Griffith's Opie. The photography and production design (by John Guleserian and John Paul Kelly, respectively) are fine, though I could have done with less of the sappy pop music. Withal, the movie has some saving graces, chiefly the likeable Domhnall Gleeson, son of the excellent Brendan Gleeson. Young Gleeson's scenes with Bill Nighy, trading Curtis' clever, low-key dialogue, are a pleasure. 2 1/2 out of 4 stars.